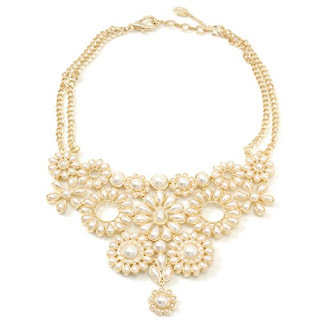 The Chic Bargainista®: Award Season Bling: The Statement Necklace. For all of us who love the red carpet walk of style, good news! Award Season is still on and tomorrow The Grammys will be broadcasting live from Los Angeles. Last night gave us a little Grammy style preview with the Grammy sponsored MusiCares benefit to honor Neil Young. While the very cool Neil is not a fashionista by any means, there were some amazing looks on the Red Carpet. Pictured above is one of my favorites, Sheryl Crow wearing and exquisite statement necklace by Los Angeles designer Irene Neuwirth. The is piece is such a show stopper. Her necklace is 18kt Rose Gold Necklace set with Labradorite and Onyx. The necklace is several thousand dollars, so I can't say it's a chic bargain :) What I like is the pairing of a "statement" necklace with a little black dress. The necklace draws the eye up so you really notice the beauty of the wearer. Look for fashionable statement necklaces at discounters like T.J. Maxx. Forever21, Loehmanns and Kohl's. One striking statement necklace that I like is this one by Amrita Singh. I have seen these at both T.J. Maxx and Loehmann's in their locked jewelry counter. Ask one of the sales clerks to help you to try on the pieces. They are amazing! Pictured:Amrita Singh's Mother of Pearl Bib Necklace is a statement piece you can find at your local Loehmann's or T.J. Maxx. The piece really dresses up a little black dress. 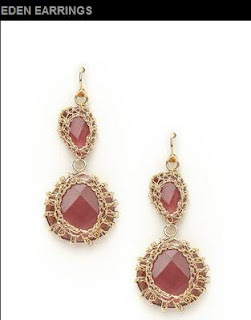 To see some of Amrita Singh's statement pieces online, click over to HauteLook online shopping club. Click this sponsored link from HauteLook to join and shop as my guest. Most of their Amrita Singh pieces are under $50.00. For a pair of earrings similar to what Sheryl wore at MusiCares, check out Kendra Scott Jewelry at sale at Gilt Groupe. Click this sponsored link from to join Gilt Groupe and shop as my guest. One of my favorite pieces are the Eden earring for $45.00 US. Pictured: Red Carpet ready Kendra Scott's two faceted amethyst quartz stones wrapped in gold plated brass wire, on sale at Gilt Groupe.